Sludge treatment for ponds, Bio Lake Sludge Buster from OES, Lake Musconetcong is located on the border of Morris County and Sussex County, New Jersey, and is part of Hopatcong State Park, which is administered by the New Jersey Department of Environmental Protection. The Musconetcong River flows through the lake. 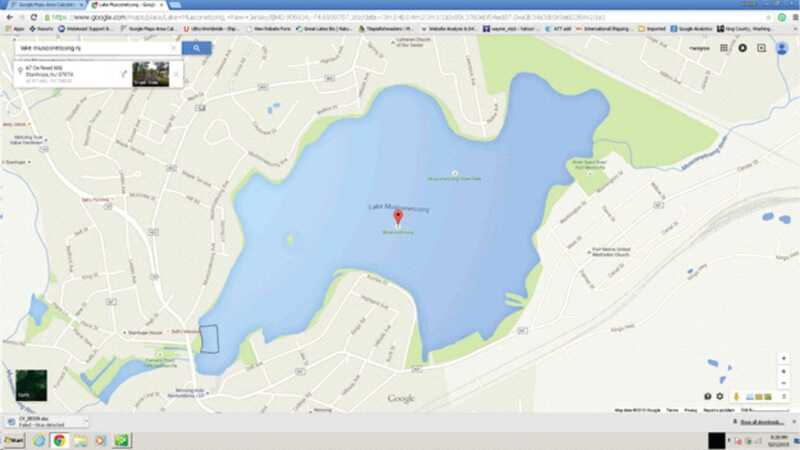 The lake covers 329 acres (1.3 km²), with a mean depth of approximately 5 feet (1.5 m) and a maximum depth of 10 feet (3.0 m). The lake’s watershed covers 14,000 acres (57 km²). 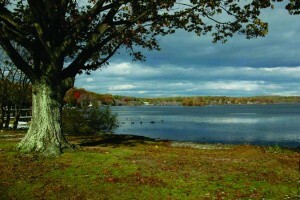 Lake Musconetcong is downstream of Lake Hopatcong, the largest lake in New Jersey and is part of its watershed. 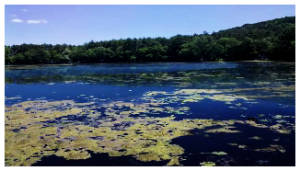 Since this lake is shallow, it has experienced ongoing problems with weeds (especially near the shore line), and accumulated organic sediment has become a pressing issue. Over the years, the algal and weed blooms, ongoing herbicide applications, and resulting residue from die-offs has resulted in considerable bottom sediment problems. “Bio Lake Sludge Buster” for Sludge Reduction. BLSB, a prepared blend of muck digesting beneficial bacteria, it has been used successfully around the world to solve sludge build up problems. 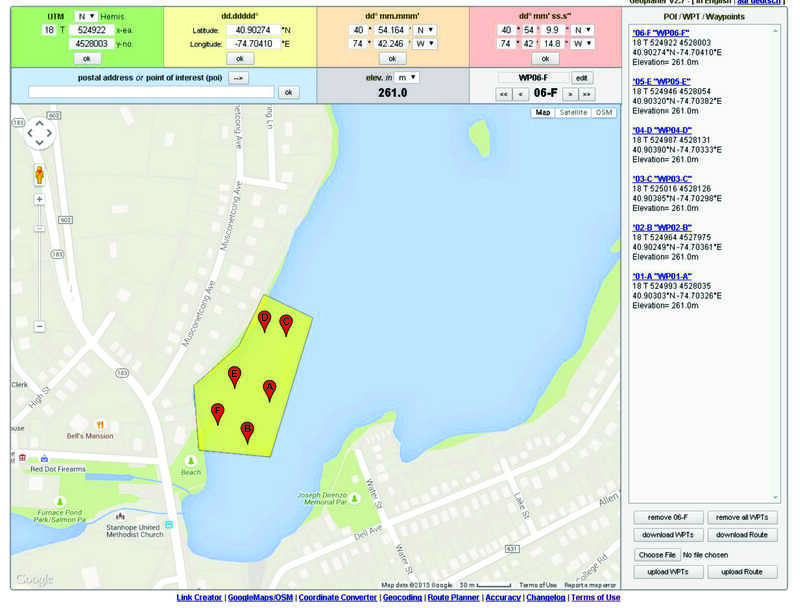 In this situation, with a known sludge problem around the lake, the authorities chose a specific section of the lake to test the muck reducing ability of “Bio Lake Sludge Buster” from OES. 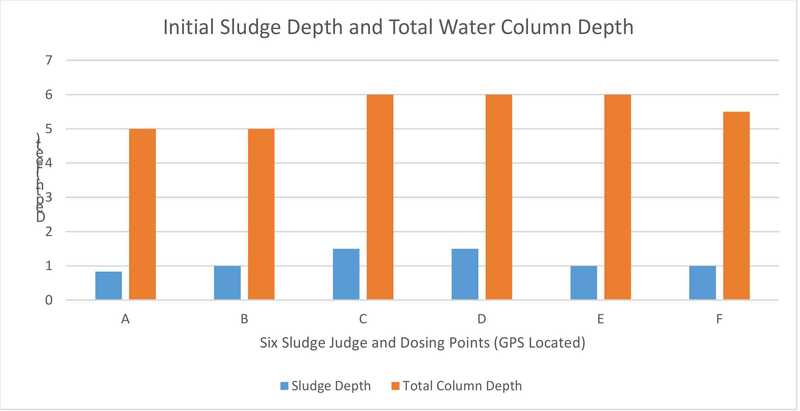 As shown in the chart above, the initial measurements (before dosing, performed June 1, 2015 using the sludge judge technique):Total water column depth (average) = 5.6 feet muck depth (average) = 1.14 feet. 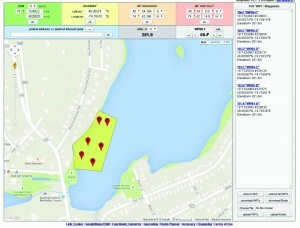 Therefore, before the trial began, the average sludge depth of 1.14 feet was 20% of the total lake depth in that area. “BLSB” was prepared off-site, and brought to the lake once a week during July, August, and September 2015. The product was prepared in a 275 gallon tote (see photo to left). 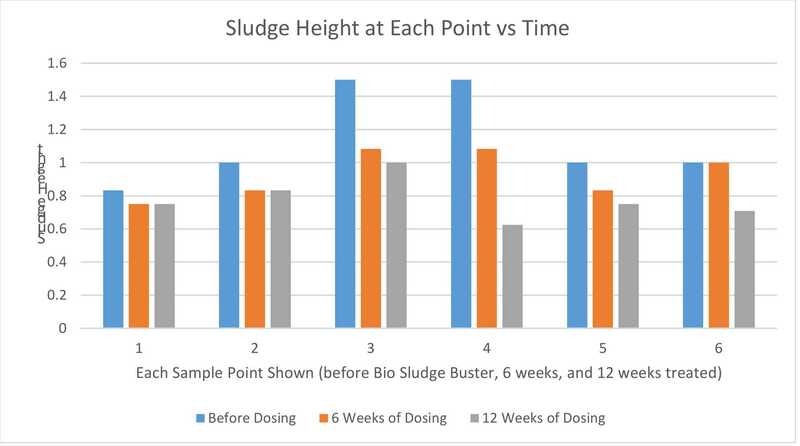 Each week, 275 gallons of liquid prepared Bio Sludge Buster were brought to the lake site and dosed as close as possible to the 6 noted dose / sample points.Every week, about an equal amount of product was applied to each of the six GPS identified points. 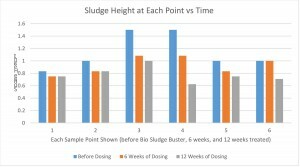 Sludge treatment for ponds, Bio Lake Sludge Buster from OES, The results are clearly shown in the charts below, with 3 measurements at each point: before dosing, 6 weeks into dosing, and 12 weeks into dosing. 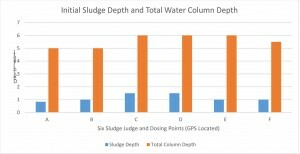 All measurements were made using the same sludge judge technique, with the same technician, and with all measurements overseen by lake authorities.